My Fourth Versatile Blogger Award! Wow! 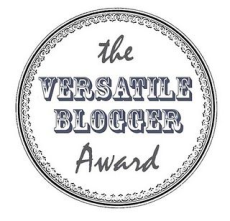 I have now been nominated four…yes I said four…times for the Versatile Blogger Award. Thank you to Eva at My Miracle Life for this nomination, for which I am extremely honored. Provide the link and name of the blogger who nominated you – and thank them. Nominate any number of fellow bloggers, adding a link to their blog. Go and make yourself some coffee and/or write a nice letter to someone. Punctuation is not one of my strong suits. Snow is not my friend. I run away from bees. This entry was posted in All, Blogger Awards and tagged blog awards, Versatile Bloggers Award. Bookmark the permalink. Congrats! As I get a tad older, I don’t think snow is a friend of many. Similar to you, my daughter is still lamenting my use of semi-colons… I have been studying them but still, not too sure. And being versatile, you can simply now make things up as you continue to accept these awards!